Students might have noticed new artwork at the University Village Center on their way to grab a bite to eat. But what they might not have noticed is that the artwork is by their peers. Senior visual art majors Jansen Howard and E.B. Jauer were selected as part of Kevin Kratt’s program to display their art at the University Village Center last October. Their sculptures were installed in May. 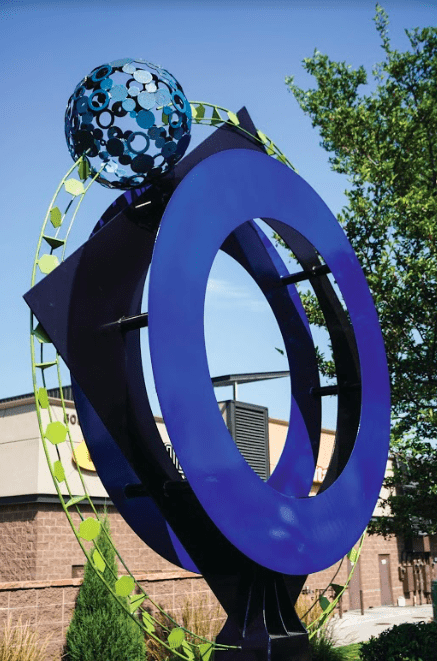 Kratt, president and founder of Kratt Commercial Properties and developer of the UVC, created a program that granted two students each year $5,000 to complete their public sculptures. The first student sculpture he featured at his shopping center was back in 2011. In order to be approved to create one of these sculptures, juniors or seniors within the Visual Arts Program must submit a cover letter, their designs and a portfolio that includes images of their work. Once they have submitted all the required materials, Kratt will select two students. Howard’s sculpture, ‘Synchronicity,’ is located at the south end of the line of sculptures at the UVC. She admitted that at first, she wasn’t sure what her sculpture would be. Sacred geometry “involves sacred universal patterns used in the design of everything in our reality,” according to Crystalinks. It is the belief that geometry and mathematical ratios make up many sacred symbols we can identify throughout history. Jauer’s sculpture, located next to Tokyo Joe’s, resembles a shooting star and is the first kinetic, or moving, piece to be installed. Jauer explained how her design was impacted from the loss she felt in 2016 and, at the same time, inspired by one of her favorite artists, David Bowie. “I have a tattoo that says, ‘I leave my love between the stars,’ so I was trying to think of something that was sort of like a memorial to him. At the same time, I wanted to come up with something where the stars moved because I was also influenced by Starr Kempf who was a local artist and works with a lot of kinetic art,” said Jauer. Matthew Barton, associate professor and co-director of the Visual Art Program, said that the UVC projects usually begin in late January or early February and can last into the summer months. According to Jauer, Kratt chooses sculptures that will be realistically made in a reasonable time frame and within the budget. He also looks for long-term and minimal maintenance pieces as well. During the process, students can seek advice and assistance from fabricators – artists who will build the sculpture for or work collaboratively with the student — provided by Kratt. Howard and Jauer both worked with Jody Bliss, a fabricator in Monument who has two of her own sculptures featured at the UVC. Jauer would visit Bliss every Thursday for about every hours a day for three weeks in a row. 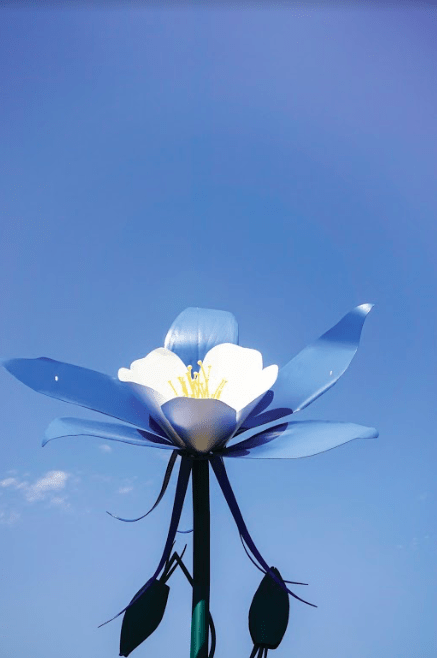 “This fabricator was willing to open her shop to us and let us be a part of the process, which really offered us a great learning opportunity and first-hand experience working with the material to create the sculpture,” said Howard. Both Howard and Jauer were excited to be chosen to complete a sculpture for Kratt and expressed how encouraging and supportive he was of their work. Howard explained what this opportunity meant to her and why she feels so grateful to Kratt for developing this program. “As an artist, it is really hard to make a living even with a college degree, and to know how to put yourself out there. The experience we got of writing a proposal, budgeting, and working with deadlines is priceless experience going into the real world,” said Howard.